This innovative underground band formed in 1969 in Melbourne. Instrumentally, they have been likened to early Soft Machine or Egg. Musically, they played long instrumental passages with unusual lyrics and light shows. Some of their songs were finely structured whilst others were heavier and very unpredictable. As music of this type had very limited commercial appeal, they played dance music, too, under another name, The Murtceps. Still, they enjoyed a No. 4 hit with I'll Be Gone during a twenty-five week stay in 1971. A much compiled track you'll also find it on Australian Rock Classics, Go Set Pop Poll Awards 1970 (along with Going Home), Molly's Australian Evolution, Sunbury '72, together with Some Good Advice), Trax Australian Made II and Nat Young's History Of Australian Surfing. Their albums sold well too, Spectrum Part 1 narrowly missed the Top 20, something which Milesago rectified towards the end of 1971. The hit single version of I'll Be Gone was an unedited mono cut of the original full length master, which only appeared in original form on the Go-Set Pop Polls Awards 1971 album at the time. It was later included on the Spectrum compilation Red Orange Yellow Green Blue Indigo Violet. Both I'll Be Gone and its flip side were covered by Manfred Mann's Earthband. 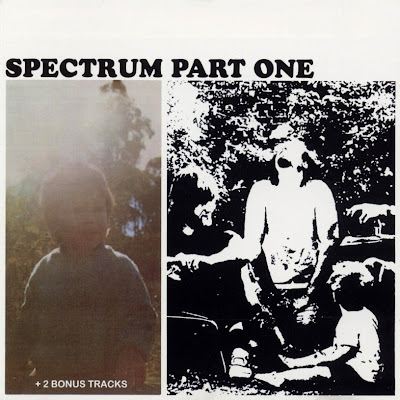 Spectrum Part One is a quintessential Aussie progressive rock item. Described by Ian McFarlane in 'Freedom Train' as a tremendous guitar/organ-driven, prog/psych classic, it's notable for the druggy Make Your Stash whose chorus was based around the beautiful Jupiter movement of Holst's Planets Suite; the Pink Floyd-inspired Fiddling Fool and the beautiful Superbody. For the follow-up 45 they released an edited version of Trust Me. The song was written by new drummer Ray Arnott and had been performed by his earlier band Company Caine. The flip contained an instrumental Going Home. Too complex for the singles market it sold poorly as did the follow-up But That's Alright, despite being a much catchier number. 1971 was also the year Spectrum developed an alter-ego, Indelible Murtceps with the same personnel Mike Rudd launched a money-making assault on the dance/disco circuit, leaving Spectrum to concentrate on a more esoteric sound. Milesago was an ambitious double album, which was musically very diverse but, as is often the case with double albums, failed to maintain a consistent standard throughout. The title track was an ambitious avant-garde number; Fly Without Its Wings had lots of atmosphere and both contrast greatly with acoustic tracks like Tell Me Why and faster numbers like But That's Alright and The Virgin's Tale. December 1973 saw the release of the double live album Terminal Buzz. The material was taken from the band's farewell live concert on 15th April 1973 and spanned their whole career. Earlier in the year they contributed, as one would expect, the spacey, more esoteric material to Testimonial, which was credited to Spectrum / Indelible Murtceps. Their cuts included It Would Be Nice, Homesick Valium Blues, Who Is Bugging You? and Essay In Paranoia.